Simon Lemaire: Thursday 16 April at 3 pm, A415 Inria Paris. We are interested in physical settings presenting an interface between a classical (positive) material and a (negative) metamaterial, in such a way that the coefficients of the model change sign in the domain. We study, in the « elliptic » case, the numerical approximation of such sign-shifting problems. We introduce a new numerical method, based on domain decomposition and optimization, that we prove to be convergent, as soon as, for a given right-hand side, the problem admits a solution that is unique. The proof of convergence does not rely on any symmetry assumption on the mesh family with respect to the sign-changing interface. In that respect, it gives a more convenient alternative to T-coercivity based approximation in the situations when the latter is applicable, whereas it constitutes a new paradigm in the situations when the latter is not. We illustrate our findings on a comprehensive set of test-cases. February 20 – Thirupathi Gudi: An energy space based approach for the finite element approximation of the Dirichlet boundary control problem. Thirupathi Gudi: Tuesday 20 February at 3 pm, A415 Inria Paris. In this talk, we review some approaches for formulating the Dirichlet boundary control problem and then we present a new energy space based approach. We show that this new approach allows high regularity for both optimal control and the optimal state. Using, the optimality conditions at continuous level, we propose a finite element method for numerical solution and derive subsequent error estimates. We show some numerical experiments to illustrate the method. Franz Chouly: Thursday 15 February at 2 pm, A415 Inria Paris. In the first part of this talk, we will present a residual based a posteriori error estimate for contact problems in small strain elasticity, discretized with finite elements and Nitsche’s method. Upper and lower bounds are established under a saturation assumption. This theoretical results will be illustrated by some numerical experiments (joint work with Mathieu Fabre, Patrick Hild, Jérôme Pousin and Yves Renard). In the second part of this talk, we will present preliminary results on goal oriented error estimates for soft-tissue biomechanics, still under small strain assumptions. The performance of the Dual Weighted Residual method will be assessed for two simplified scenarios involving tongue muscular activation, and contraction of the arterial wall. Open mathematical questions and the potential interest of such a methodology for computational biomechanics will be discussed (joint work with Stéphane Bordas, Marek Bucki, Michel Duprez, Vanessa Lleras, Claudio Lobos, Alexei Lozinski, Pierre-Yves Rohan and Satyendra Tomar). Théophile Chaumont: Monday 18 September at 1 pm, A415 Inria Paris. Time-harmonic wave propagation problems are costly to solve numerically since the corresponding PDE operators are not strongly elliptic, and as a result, discretization methods might become unstable. Specifically, the finite element solution is quasi-optimal (almost as good as the best approximation the finite element space can provide) only under restrictive assumptions on the mesh size. 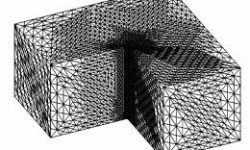 If the mesh size is too large, stability is lost, and the finite element solution can become completely inaccurate, even when the best approximation is. This phenomenon is called the « pollution effect » and becomes more important for larger frequencies. For the case of wave propagation problems in homogeneous media, it is known that high order finite element methods are less sensitive to the pollution effect. For this reason, they are employed in a wide range of applications, as the corresponding linear systems are smaller and easier to solve. In this talk, we investigate the use of high order finite element methods to solve wave propagation problems in highly heterogeneous media. Since the heterogeneities of the medium can exhibit small scale features, we consider « non-fitting » meshes, that are not aligned with the physical interfaces of the medium. Instead, the parameters defining the medium of propagation can be discontinuous inside each element. We propose a convergence analysis and draw two main conclusions: – the asymptotic convergence rate of the proposed finite element method is suboptimal due to the lack of regularity of the solution inside each cell – the pollution effect is greatly reduced by increasing the order of discretization. We illustrate our main conclusions with geophysical application benchmarks. These examples confirm that higher order methods are more efficient than linear finite elements. Gouranga Mallik: Thursday 29 June at 3pm, A415 Inria Paris. In this work we consider a priori and a posteriori error control for the nonsingular solution of von Karman plate bending problem. Conforming and nonconforming finite element methods are employed. Existence, uniqueness and error estimates for the discrete solution are presented. We discuss an abstract framework for a posteriori error control which includes conforming and nonconforming finite element methods. This allows us to compute reliable and efficient local estimators. The key ingredients in establishing well-posedness of the discrete problem rely on the linearization of the continuous problem and suitable enrichment operator. Numerical experiments are performed to justify the theoretical results. Patrik Daniel: Thursday 15 June at 3:30pm, A415 Inria Paris. We propose a new practical adaptive refinement strategy for hp-finite element approximations of elliptic problems. Following some recent theoretical developments in polynomial-degree-robust a posteriori error analysis, we solve two complementary classes of discrete local problems on the vertex-based patches. The first class involves the solution on each patch of a mixed finite element problem with homogeneous Neumann boundary conditions, which leads to an H(div,Ω)-conforming equilibrated flux. This in turns yields a guaranteed upper bound on the error and serves to mark elements for refinement via a Dörfler bulk criterion. The second class of local problems involves the solution, on each marked patch only, of two separate primal finite element problems with homogeneous Dirichlet boundary conditions, which serve to decide between h-, p-, or hp-refinement. Altogether, we show that these ingredients lead to a computable error reduction factor; we guarantee that while performing the hp-adaptive refinement as suggested, the error will be reduced at least by this factor on the next hp-mesh. In a series of numerical experiments in two space dimensions, we first study the accuracy of our predicted reduction factor: in particular, we measure the ratio of the predicted reduction factor relative to the true error reduction, and we find that it is very close to the optimal value of one for both smooth and singular exact solutions. Finally, we study the overall performance of the proposed hp-refinement strategy on some test cases, for which we observe effectivity indices very close to one and exponential convergence rates. Jad Dabaghi: Thursday 15 June at 3pm, A415 Inria Paris. We propose an adaptive inexact version of a class of semi-smooth Newton methods. As a model problem, we consider the system of variational inequalities describing the contact between two membranes and its finite element discretization. Any iterative linearization algorithm like the Newton-min, Newton-Fisher Burmeister is taken into account, as well as any iterative linear algebraic solver. We prove an a posteriori error estimate between the exact solution and the approximate solution which is valid on any step of the linearization and algebraic resolution. This estimate is based on discretization and algebraic flux reconstructions, where the latter one is obtained on a hierarchy of nested meshes. The estimate distinguishes the discretization, linearization, and algebraic components of the error and allows us to formulate adaptive stopping criteria for both solvers. Numerical experiments for the semi-smooth Newton-min algorithm in combination with the GMRES solver confirm the efficiency of the method.